Natural healing therapy machines. Ideal for home use, or used as complimentary integrative healing modalities in health care centers, clinics, hospitals, health clubs and spas. High quality medical machines that utilize the natural healing powers of the body - No drugs, no invasive procedures, no toxic side effects. HTE head office Los Angeles, CA, USA. in Japan, Australia, Canada, USA. healthy back support, and more. healthy lung function, relaxation and more. and anti-aging. Power up your entire body. Movement of the body promotes circulation and increased oxygen, stimulation of the lymphatic system which promotes elimination of metabolic waste and toxins, lymph drainage, healthy back support and flexibility, promotes ANS balance, ordinary weight loss, temporary relief from muscle pain, internal massage and relaxation. Invented by Japanese scientist Dr. Inoue. The Original Chi Machine has never been changed internally since it was created in 1990, because nothing needs to be improved. 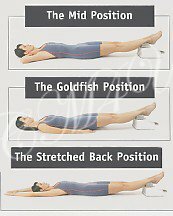 One set speed for maximum benefit and harmony of the body. All metal parts and a strong motor. 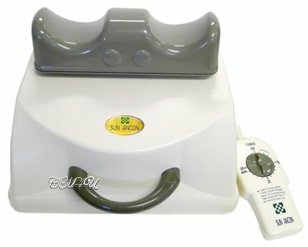 Sun Ancon Chi Machines are proven to last for 15 to 25 yrs, and very rarely breakdown. Swing Frequency: 140 oscillations per minute. Self Timer: 2 to 30 minutes. Well known in Europe by German oncologists, Far Infrared heat therapy is used to rapidly relieve pain, swelling and inflammation, elimination of serious toxins, healthy lung support, increased circulation, accelerated healing, relaxation and more. The SOQI Dome is the best Far Infrared Sauna on the market. No other company has been able to duplicate this technology. 100% Far Infrared Ray for maximum health benefits. More information - one size fits all. An advanced natural health therapy, well known in Germany and Russia, the future of medicine has arrived. The E-Power Machine is primarily used to communicate and reconnect the electrical circuitry of the body, and to relieve pain. The E-Power boosts ATP and negative ion production, promotes hours of energy, supports pH balance, stabilizes blood sugar levels, and has anti-aging properties. 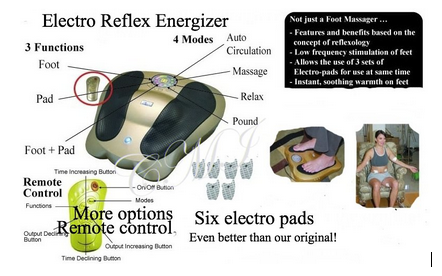 Reflexology for powerful stimulation of the feet and legs to relieve pain and soreness. Hands and wrists may also be used. The Electro Reflex Energizer promotes re-connection and communication of electrical circuitry. If there is loss of feeling in the feet or legs, adjust the dial accordingly as sensation returns. 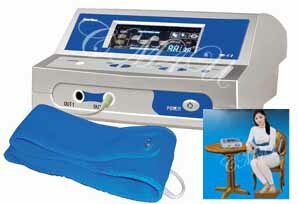 Comes with x6 electro-pads to target different body areas. Based on the ancient healing art of Reflexology. 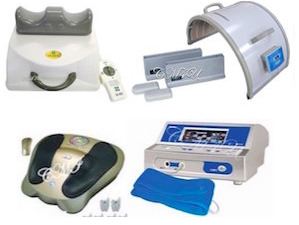 Massage Table plus x3 Far Infrared Domes and x1 Original Chi Machine - Built in MP3 player with x2 Speakers. Luxury SOQI Bed, intense natural healing for home use, or may be incorporated into any professional health and wellness business. Cozy and soft , this far infrared heating pad relieves local aches, pains, soreness, muscle tension and monthly pain. Adjustable temperature control. Not to be used as a heating blanket. Two sizes. Comes with its own carry bag - Two sizes available. All prices are set by HTE head office Los Angeles and charged in American dollars. 2) SHIPMENT LOCATION: All machines are shipped from head office Los Angeles, CA USA. NOTE: Shipping is expensive, so we recommend that if you or friends/family visit the USA, order ahead and have it delivered during the visit, then take back on the plane. Be sure to request 220v. 3) VAT: VAT payable upon delivery. 4) REPAIR if ever needed, available in UK. This website is for informational and educational purposes and is not intended as a substitute for medical advice from your chosen healthcare specialist. Chi Machine International does not claim that any HTE product presented herein will cure any specific illness or disease. Always ask questions and research everything. ©2002-2019 Copyright Chi Machine International.